The MENCS will compete at Auto Club Speedway this week in the Auto Club 400. The race will likely be more unpredictable from what we have seen in the past at this track. The full aero package will be used again this week so that means the 2” splitter, 8” spoiler, reduced horsepower (550 HP) and the aero ducts will be in play. Pit strategy will be a major factor in the race since track position is so important. It should be an exciting race to watch. The Auto Club 400 can be seen at 3:30 p.m. ET on Fox. So far the Fantasy Live picks are performing well. We are climbing closer to the top 99% but we are not there yet. My picks are currently beating 98.2% of the competition. The picks have scored well but we keep having one driver holding us back from having a perfect lineup. Hopefully this is the week we score the top score and race to the top of our league standings. I am going to try and make it through this race without use the “Big Three” from last year. Kyle Busch, Kevin Harvick and Martin Truex Jr. should all run well Sunday but we cannot use them every week. I am loading up on Team Penske and adding in some drivers on a hot streak. Joey Logano (8): Logano has never won at Auto Club but that could change Sunday. Logano qualified 5th and posttest the 6th fastest speed in final practice. He also had the fastest 15-lap speed and the fastest 20-lap speed. The word in the garage is that the No. 22 in the car to beat this week. Logano won the last race (Las Vegas) using this aero package. Logano is my pick to win Sunday. Brad Keselowski (9): Keselowski has been the best driver so far this season in the new aero package. He won the race at Atlanta and finished 2nd at Las Vegas. His stats at Auto Club are pretty good too. Keselowski has not finished outside the top 10 at this track since 2014. Keselowski posted the fastest speed in final practice and had the 2nd fastest car on the long runs. I expect Keselowski to score a lot of Stage points and be a threat to win the race Sunday. Ryan Blaney (8): The No. 12 car will be the third Team Penske car in my lineup. The team worked on handling in “dirty air” in practice. I really think a good handling car will perform well Sunday. Blaney was 5th fastest in final practice with the 3rd fastest 20-lap speed. Blaney starts 10th and he should spend a lot of time in the top 10 scoring Stage points. Kyle Larson (9): I am worried a bit about Larson’s qualifying position. Larson was the first car on the track so he did not have the benefit of the draft. His car was fast in practice though. Larson did not have the fastest car in practice but he did not seem to be too worried about it. He has led 110 laps and finished 1st and 2nd in his last two races at Auto Club. 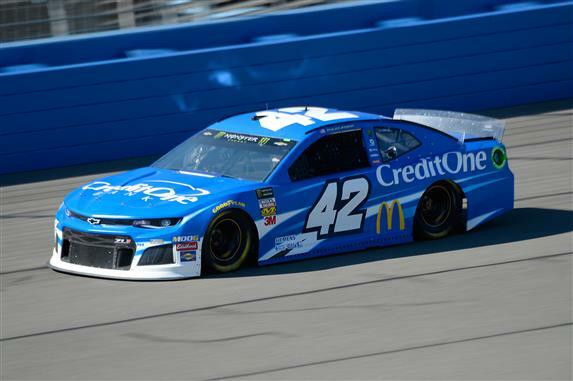 Larson should easily finish inside the top 8 at his best track. Aric Almirola (9): Almirola has finished every race since last August on 1.5-mile or 2-mile ovals in the top 10. He should add another top-10 to the list Sunday. Almirola qualified 3rd and track position is very important at Auto Club. He posted the 4th fastest speed in final practice. Almirola finished 8th at Atlanta, 7th at Las Vegas and 4th at Phoenix. He is running too well right now to leave on the bench. My Garage Driver will be Kyle Busch. His car is fast enough to finish in the top 5 and if we had unlimited allocations the No. 18 car would be in my starting lineup. I want to save my starts with Busch for the short tracks but I need a good insurance policy. It does not get better then Busch in the Garage.